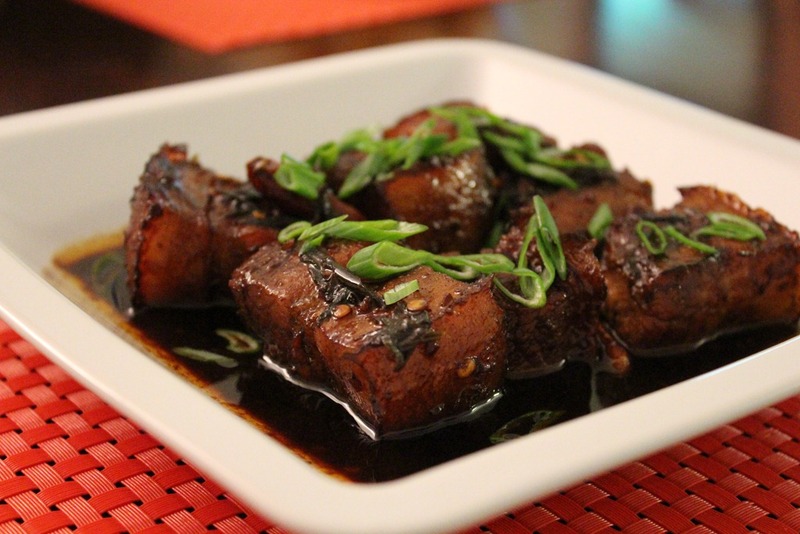 Collaboration with S.O.F.A.T Blog: Pork Belly! Hi everyone! I was lucky enough to do my second blog collaboration with and old friend, Michael from S.O.F.A.T Blog. If you remember, my first one was with Christine from Christine’s Kitchen Chronicles back in September, check out the post here. Michael came to visit New York and through a mutual friend we decided to do a blog collaboration using PORK BELLY as our secret ingredient! The result? Oily Goodness. I decided to do the pork belly two ways. First is pork belly braised low and slow. 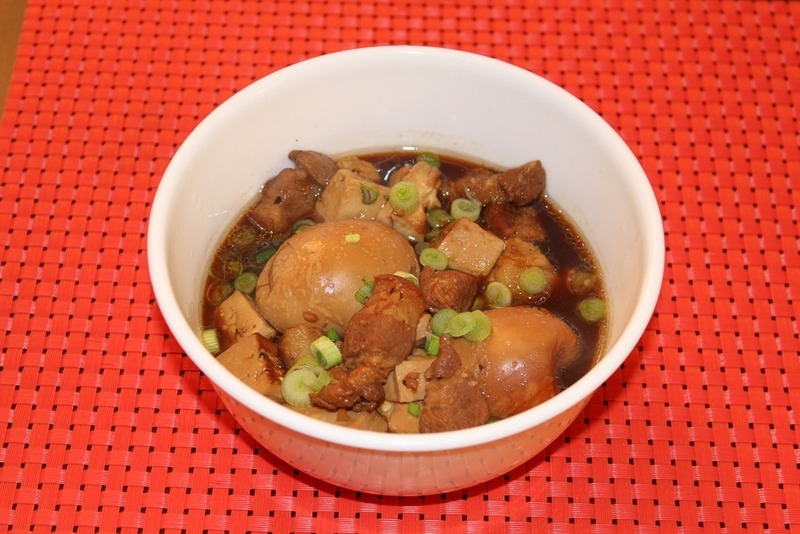 I used regular soy sauce, Tamari/dark soy sauce (for color and depth of flavor), finely chopped ginger, a bit of garlic, a bit of sugar, salt, and pepper. You can also see from the picture that I used some dried hot peppers which gave the dish some serious kick! I grew up in Indonesia eating spicy food since I was a toddler, so you can omit this part if you prefer sweet over spicy. I garnished the dish with scallions. I have to give credit to Michael for inspiring me with this particular scallion diagonal knife cut as it looked so pretty! I learned this from his In-the-Kitchen Video 01 – Green Onions (Scallions) post/v-log, which he debuted in mid-March. The hubs and I enjoyed this dish with steamed white rice. I think we had some white wine to accompany it as well, a nice, smooth and slightly sweet French Vouvray to cut through the spiciness. My second pork belly dish was inspired by my lovely mom. 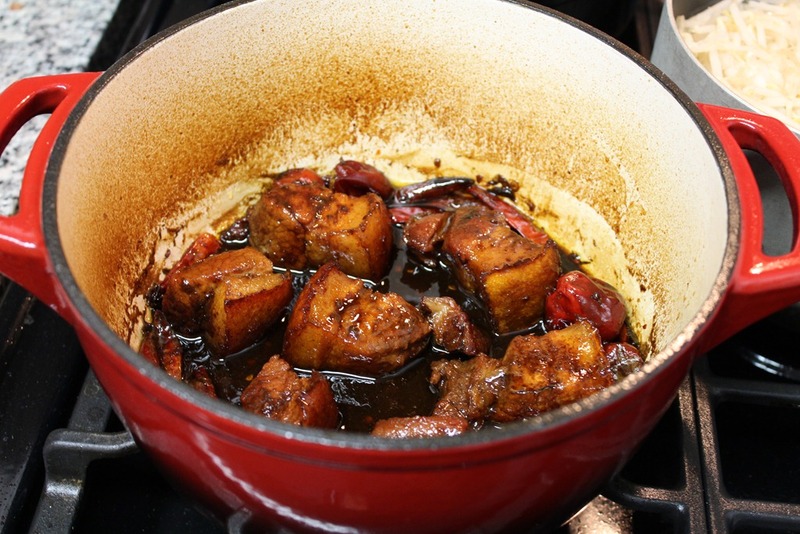 We call this Babi Kecap in Indonesian, which literally translates to “Soy Pork.” This is something she used to cook for me and my sister growing up. 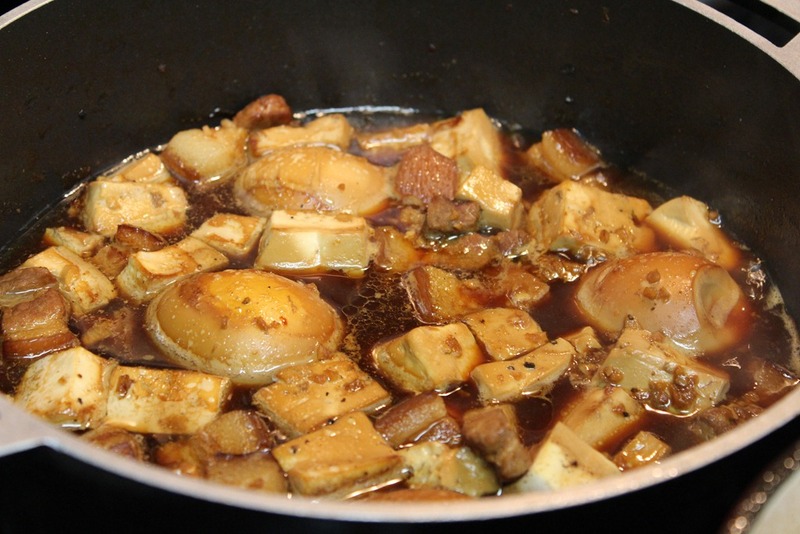 The dish contains pork belly cut up in small pieces, hard-boiled eggs, and tofu. It’s all simmered in broth that’s seasoned with regular soy sauce, dark soy sauce, and sweet soy sauce (kecap manis, ABC is my fave brand for this particular item), and of course some s+p. Taste as you go and trust your instinct! I sent this picture to my mom and I think she was quite impressed =) She taught me well. Not too many pictures this time, but please head over to S.O.F.A.T and check out Michael’s food journey in his beautiful pictures. Did I tell you that Michael also used to lead delicious dumplings food tours around our hometown in California? Yeap! This guy has a lot of tricks up his sleeves. I can’t wait to see what is more to come from his blog, and especially from his new video series! Until next time everyone, keep whisking away! or like what Michael says, let’s all get…. S.O.F.A.T. Have you ever watched Food Network’s Throwdown with Bobby Flay? I always love it when the local wins :) Like in this episode where Bobby went to Phil’s Fish Market in NorCal and Phil won with his Cioppino. One day, Bobby… one day… I’ll take you down in a Throwdown. Meanwhile, it’s been so cold lately! One day Nemo came and gave us tons of snow… so I made snow Angelina O=) Please don’t mind my purple poofies and fake Uggs… Beautiful skyline though right? You can see the Empire State Building at center-left. and how about my artistic shot of the skyline below? Heat up olive oil in a dutch oven/heavy-bottomed pan. Add garlic and onion and cook a few minutes until softened and slightly browned, about 5 minutes. Pour in the white wine, and simmer until reduced to about 3/4 of the original volume. Add the seafood stock, tomatoes, honey, bay leaf, thyme, and hot sauce and simmer for another few minutes. Add the little neck clams and king crab legs*. Cover and steam for about 8 minutes until the clams have opened up. Throw in the shrimps and butter and let cook for another 90 seconds. Sprinkle with chopped parsley. *at one point, I had to remove all the seafood and set them on the side while I seasoned and tasted the broth to perfection. You may have to do this as well unless you have a very large pot. Subscribe to follow Whisks & Ruffles and receive notifications of new posts by email. Obsessed with all things weddings, lovely, and inspiring!